Strawberry Hill is a wonderful anomaly in the history of British Architecture. Subverting the contemporary taste for the classical language of columns, symmetry, and order, the English art historian Horace Walpole, made Strawberry Hill in the image of gothic literature and medieval imagery instead. Walpole intended a theatrical atmosphere from the outset and it attracted many curious tourists. Where you would expect medieval stone, you find papier maché and plaster. Replacing Georgian décor are gloomy, castular halls, rose windows, and Renaissance stained glass. 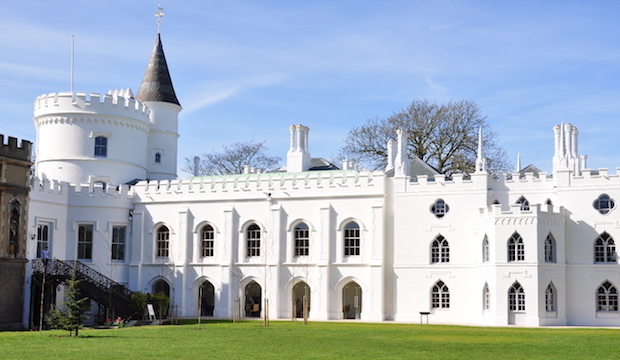 Strawberry Hill serves as an example of the depth and breadth of English stately homes and is a must-see on your list. Visiting this Villa during the out-of-hours Twilight tours is an atmospheric way to understand Walpole’s vision. In recent years, the gardens have been restored to their original state; Walpole’s grove of lime trees has been replanted and his wonderful Shell Bench has been recreated. The Teddy Bears Picnic is a lovely children’s event on the grounds themselves. For a bite to eat, visit The Cloister Coffee House under the gothic arches of the house. We love the ‘Cloister Coffee House Scone’ with mascarpone and fresh strawberries. Please click here for more information about the current temporary exhibition: Lost Treasures of Strawberry Hill: Masterpieces from Horace Walpole's Collection. Opening Times: House: Sunday - Wednesday 12pm-5pm, Thurs-Sat closed, last admission 4pm. Price: National Trust/National Art Pass Member/Student: £6.25. Non-member adult £12.50, children go free. By train: From London Waterloo to Strawberry Hill station, then five/ten minute walk to Villa. By underground: District line to Richmond and get R68 bus towards Hampton Court, alight at Michelham Gardens. By car: Recommend going by public transport as limited parking and permit-controlled parking in surrounding area. Disabled Access: Lift to first floor of the Villa, specialised group guided tours for visually impaired.